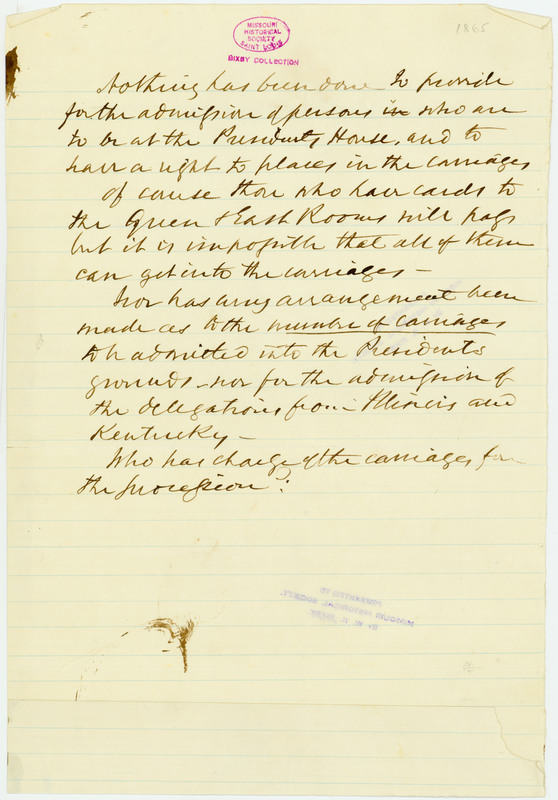 Concerns provisions for the admission of persons who are to be at the President's House, for those who have cards to the Green and East Rooms, and arrangements for them to have admission to carriages in the procession. Nothing has been done to provide for the admission of persons in who are to be at President's House, and to have a right to places in the carriages. Of course those who have cards to the Green & East Rooms will have but it is inappropriate that all of them can get into the carriages. Nor has any arrangement been made as to the number of carriages to be admitted into the President’s Grounds, nor for the admission of the delegations from Illinois and Kentucky. Austin B., Danny H., Preston P., and Hunter P.